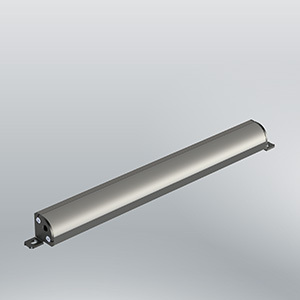 This linear LED system is made of top-grade extruded aluminum and installs easily with a number of mounting options. The modular FLOW COVE system can be used with three different LED sources and is versatile enough to adapt to a multitude of uses. Originally conceived for use in corners, it fits perfectly anywhere that optimum light distribution is needed to provide decoration, direction, or emphasis. Suitable for both area lighting and accent lighting, FLOW COVE can be ordered with a factory-configured projected angle of 60° and is the ideal choice for coves. With a variety of mounting systems and accessories to respond to specific requirements, FLOW COVE is tailor-made for your lighting projects. 24V: increments of 2” and 8”. Light engine comes with a tilt angle of 60°.